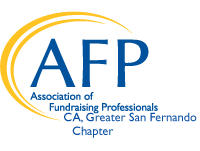 Welcome to the website for the Greater San Fernando Valley Chapter of the Association of Fundraising Professionals. We are glad you found this site, and I hope that means you are interested in developing your knowledge, skills and resources in the fundraising profession. If so, you have come to the right place! We are a chapter that is comprised of fundraising professionals from a range of non-profit organizations and consulting firms thoughout the Greater SFV area. We are a friendly, diverse group and we value and respect the amazing professionals in our Chapter and are honored by the great range of diversity and expertise found within our group, and the causes with whom we are associated. We hold monthly luncheon meetings on the first Thursday of each month, 11:30 AM - 1:30 PM at the Courtyard by Marriott in Sherman Oaks, featuring a strong and varied group of speakers and funders. These educational sessions are a great way to learn new techniques and tips to enhance your agency's development program. It is also a great way to network and learn from colleagues in the field. Please check the events calendar and sign up for one of our future luncheons today! We invite you to make time in your schedule to communicate and grow with us. On behalf of the board of the Greater San Fernando Valley Chapter, welcome! Areas served by chapter: San Fernando, Antelope, Conejo, Santa Clarita, and Simi Valley.